Our tour guide said the bottle tree was a bit misplaced in Katherine Gorge, it was originally a west-Australian species. But anyway I was happy to meet it here, as I won't come to West Australia very soon. Following a suggestion by Bråd Hallan, a visitor of this site, I now found out the exact species: It is the only member of the Baobab genus in Australia, Adansonia gibbosa, formerly known as Adansonia gregorii. 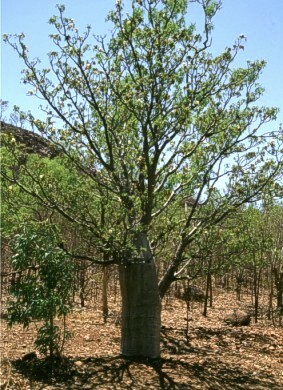 Most of the other baobab species are native in Madagascar, just one on the African mainland. Quite a distance.